Ah, Firefly. This is a favorite show for many of our friends, so it’s no surprise that we got the game. 10+ Success! The crown is yours! The first player to steal the crown wins the game. Okay, we need to take on crew and build up our Negotiate, Tech, and Fight skills and have a minimum of $7,000 (just in case) before we want to attempt these goals. We’ll also hope we get lucky with our Aim to Misbehave cards. Some only require one Skill Test like “A Little Job on the Side” (7+ Tech) while others require two Skill Tests like “Tight Security” (7+ Tech and 9+ Fight). Obviously this requires some time. When it’s a new game we have to factor the learning curve. When we got together to play this game, we initially met at 5 pm. No one noted the time actual game play began, but let’s say that by the time we all got settled in with food, decided on this game, and got it set up, we didn’t actually start playing until closer to 6 pm. According to the Story Card, that means we should have finished around 8pm, but let’s account for that additional time. We should have finished by 9pm. I think it was just after 10pm when we decided to stop. Shutter and President Gamer needed to get home to their kids, and Professor is not a night owl by any definition. But we didn’t want to just quit, so we decided to meet on a Saturday afternoon to finish the game. So we spent 4 hours playing on a Friday night, and then we played for another 2 on a Saturday afternoon, for a total of 6 hours! Or we were playing wrong. 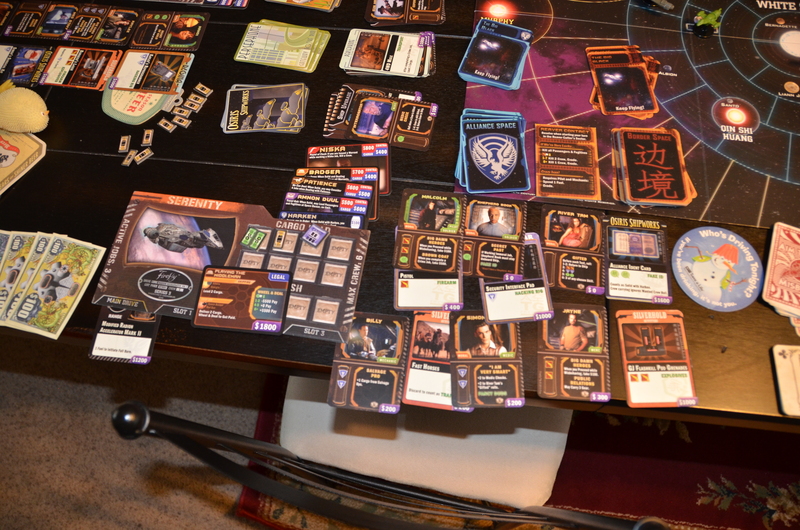 Given that the game now comes with the Story Card “First Time in the Captain’s Chair” (which only requires you to be solid with two different contacts, have $6,000, and fly to Ezra – much easier), I’m guessing the time estimate was a little off, especially for a first play through. Professor and I agree that when we play a game for the first time, and it takes forever, we’re unlikely to want to play again. 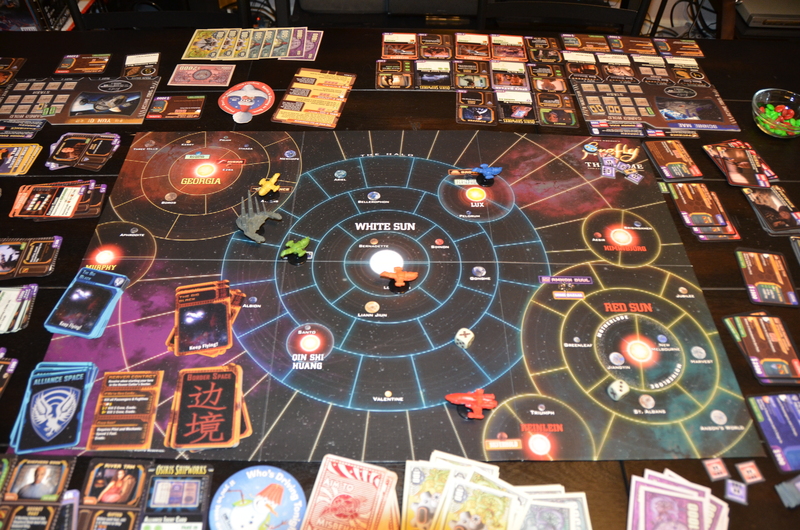 We did enjoy the game and even bought the Blue Sun expansion, but we haven’t played with that expansion because we feel like we need to carve out a huge block of time to play. Perhaps Professor and I will give it a shot with just the two of us now that we know about the new Story Card. Then maybe we can try again with more players. Lastly, the game is very aesthetically pleasing, even the rule book looks fantastic.